My cheese drawer has been looking unusually sparse these days. It used to be chock full of bits of goat cheese, a half block of cheddar, and almost always a piece of brie or manchego, sealed tightly in saran wrap and then a plastic freezer bag to ensure longevity–as if that’s a concern. I was kind of famous (at least in my head) for having the makings of a diverse cheese plate ready to go at a moment’s notice. Guests just expected cheese when they came over. In more consciously planning dinners around what’s already in the fridge and pantry lately, the cheese drawer is not in that constant state of abundance. So this week when my little sister made the train trek from NYC to Connecticut for a sleepover, I felt kind of exposed without a huge stash of cheese to whip out to accompany my new rosé discovery and general sisterly catching up. 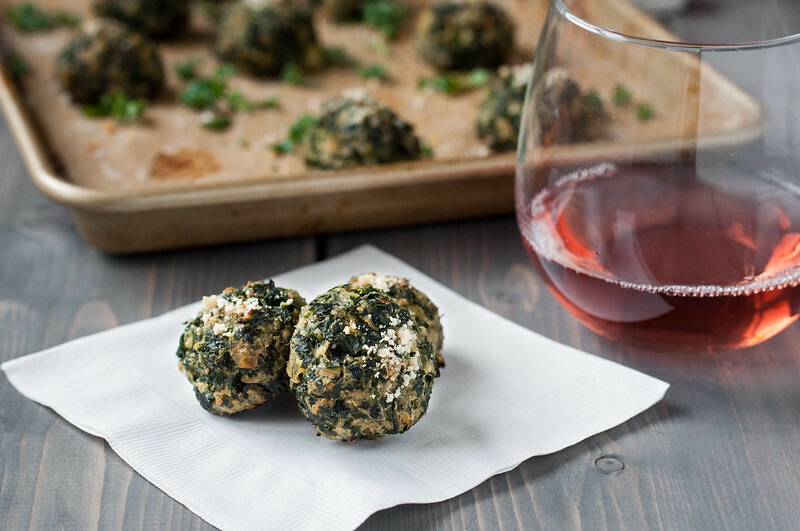 Even worse, I completely spaced (not the wine’s fault at all) on the box of TJ’s spinach and kale bites in the freezer. So Tris might have survived just fine on a half dozen leftover cookies, but we missed out on some serious recipe research I had planned. Yes, there is a reason I had pre-made (the horror!) apps in my freezer. One is, from time-to-time, I do let others do some of the work for me when I’m planning an otherwise full, labor-intensive menu. Ina is infinitely wise in this strategy, so if the ingredient list passes my approval, I’m okay with myself for doing it. Second, these spongey, salty bites are yummy and addictive, and not too hard on the budget, provided you’re not feeding 30 people. So why did I feel the need to recreate these little guys, if I’m only feeding two of us? Tasting (aka, dissecting) them from a more analytical standpoint, I realized that they’re less spinach and kale, and more egg and cheese. Kind of like a frittata ball. 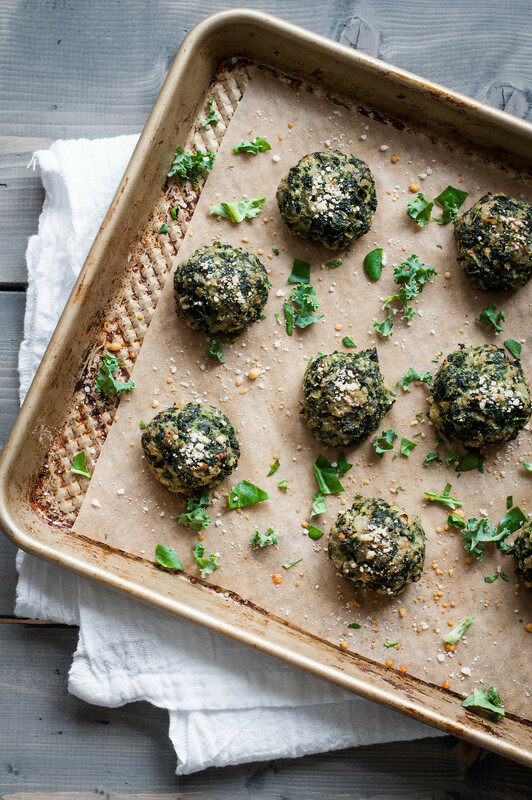 Don’t get me wrong–still tasty and made with whole ingredients, but I wanted to pack some more green power and a few more complex flavors into mine. Plus, it couldn’t hurt to store more than the 10 that come in the box. Finally, when I buy the greens whole, I know where they come from (roughly) and can choose organic, which I try to always do with leafy greens, since every possible edible portion of the plant is exposed to any pesticides it may come into contact with. More here on what produce to purchase organic, if you can. 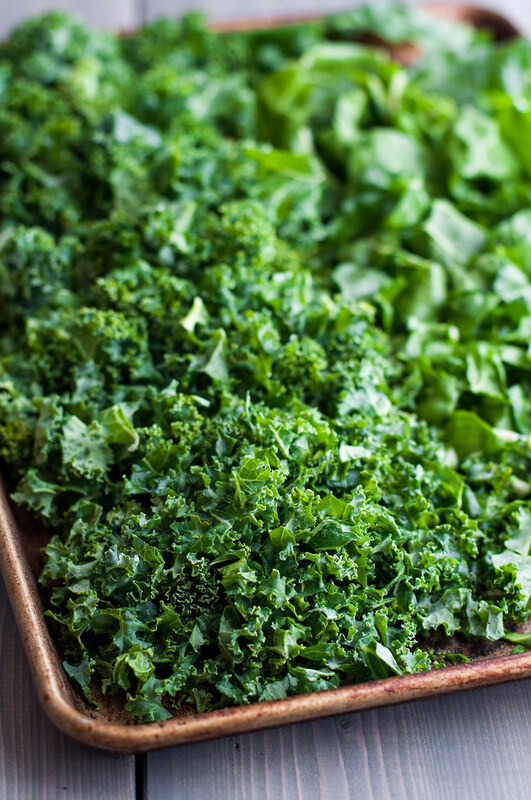 Spinach and kale are both HIGH on the list! Shopping your local farmer’s market when the markets begin to return for summer may either 1) save you money on organic produce or 2) give you peace of mind that the high (but likely justified) cost is helping provide real people directly with their living. I’m actually a little relieved about the forgotten TJ’s balls, because they, like my version, are certain to spoil dinner, which was not to be missed at our sleepover! I made up a salad of some red cabbage, red onion, avocado, and a quick Mexican vinaigrette that gets its flavor from raw spices–thank you Joy of Cooking for that revelation! (75th anniversary edition, page 189, from the shrimp and avocado tostada recipe) Then we devoured tamale pie for two. I covered a simple mix of zucchini (yes, more zucchini), frozen corn, and tomatoes with pourable buttermilk cornbread topping, then baked it in individual ramekins. Essentially a veggie tamale pot pie–one that I’ll be repeating and that you’re likely to see in some variation on Natural Comfort Kitchen in the future! Aside from being made of super fresh ingredients chopped with your own two hands (a knife is also helpful), these fritters are a one pan deal and don’t require a food processor. They keep forever in the freezer and bake up perfectly golden in whatever quantity you need. The flavor goes from simple and comforting to exciting and party-worthy when boosted with a little nutmeg and a couple spoonfuls of pesto. I might have thrown in the pesto because I have a stockpile of it in the freezer, but it smells divine and brings with it some acidity and texture, from the lemons and nuts I used, respectively, to make it (store bought pesto would totally work, too). In other words, it serves a purpose and isn’t just hanging around for fun. 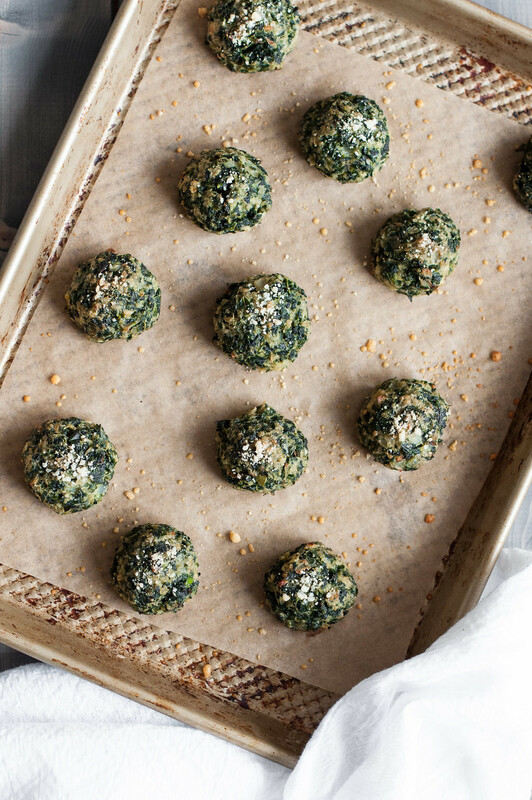 Baked cheesy kale puffs are serious business. You’ll see when you taste them. The merit of "puff" as culinary terminology is debatable. 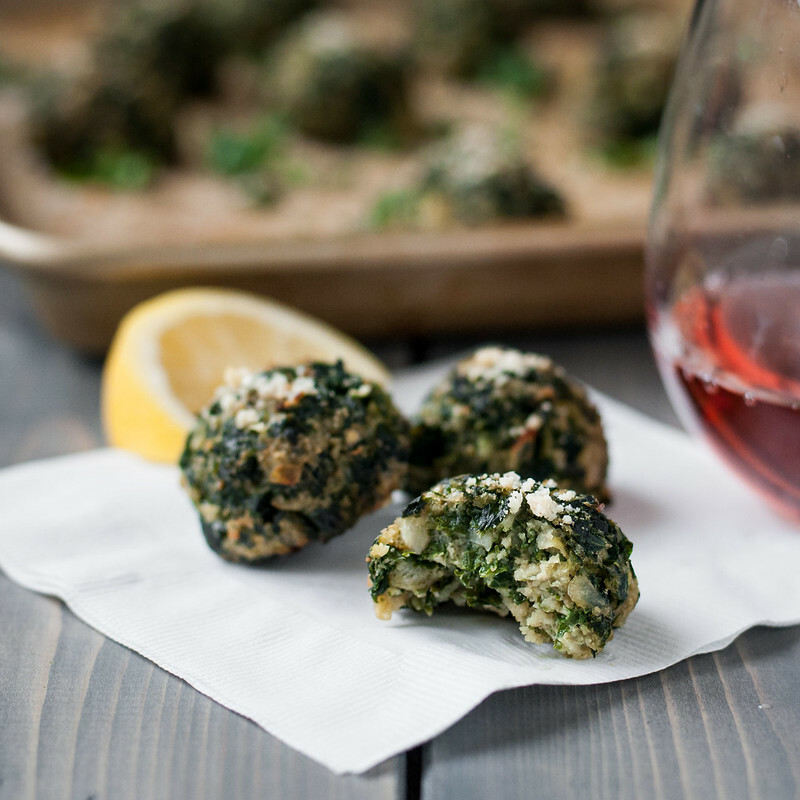 The tender texture, fun factor, and comforting flavors of these healthy bites is not. Melt butter in a skillet over medium, then add onions and cook until just softened but not brown, about 10 minutes. Add greens and ¼ teaspoon salt and continue to cook and stir until completely wilted, another 10 minutes, keeping heat low enough so onions do not brown. Remove from heat and cool for 5 minutes. Stir in scallions, panko, ½ cup parmesan, nutmeg, and pesto. Taste mixture (before adding eggs) and season, starting with ¼ teaspoon salt and ½ teaspoon pepper and adjusting to taste (I used ¾ teaspoon pepper and the flavor was very distinct). Stir in eggs, breaking up yolks and combining completely into a uniform mixture. Heat oven to 375 degrees (F) (if baking immediately) and line a baking sheet with parchment paper. 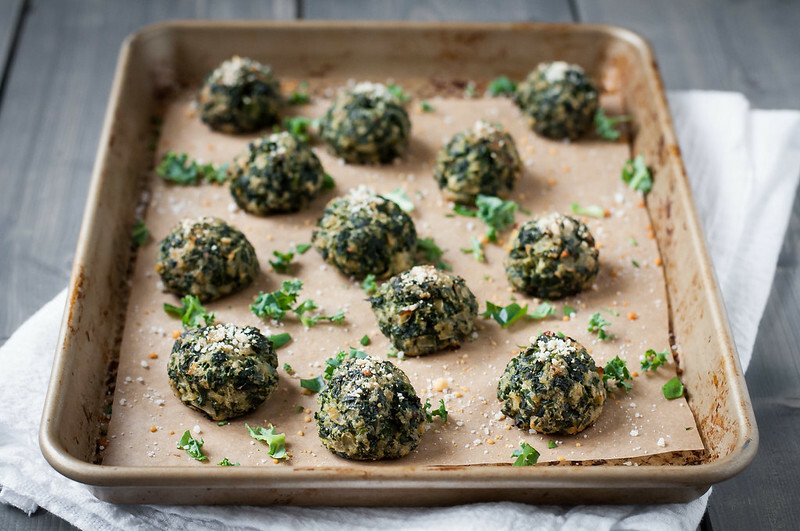 Roll the mixture into balls of 1½ tablespoons each and place on baking sheet. 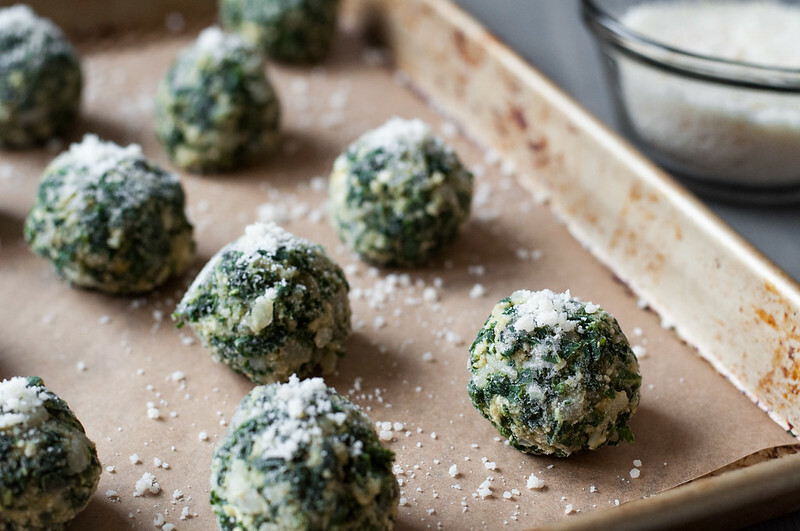 Sprinkle the top of each ball with a pinch of grated parmesan. Place tray in freezer until balls are frozen through, about 2 hours. Remove from sheet and store in freezer bag or another airtight, freezer safe container. To bake, follow directions below. Thawing not necessary—just add 5 minutes to the cook time below (25 minutes total). Bake about 20 minutes in upper third of oven, until completely cooked through (no liquid egg inside) and browned on the bottom. The puffs will spring back when squeezed lightly once cooked through. 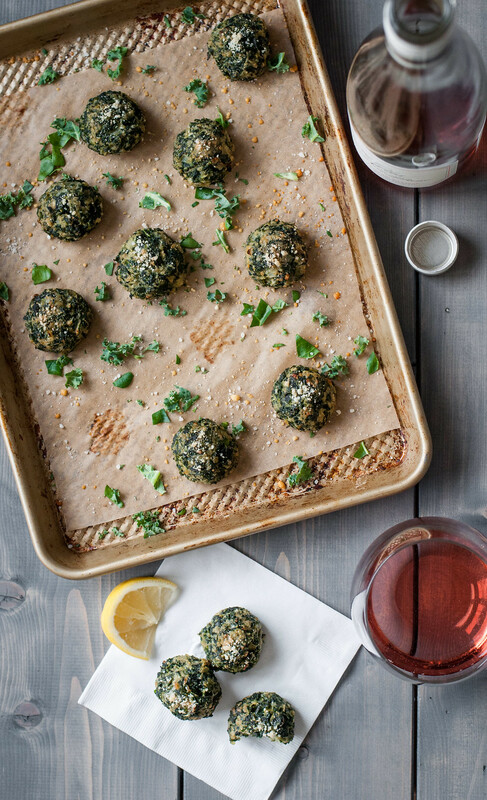 I think these would be a really fun brunch appetizer! 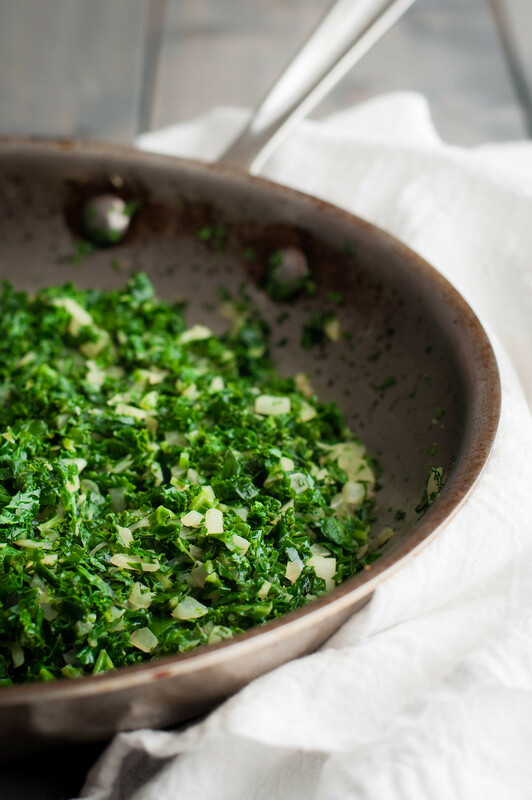 In testing, I used Swiss chard and green kale (the fluffy, curly one). 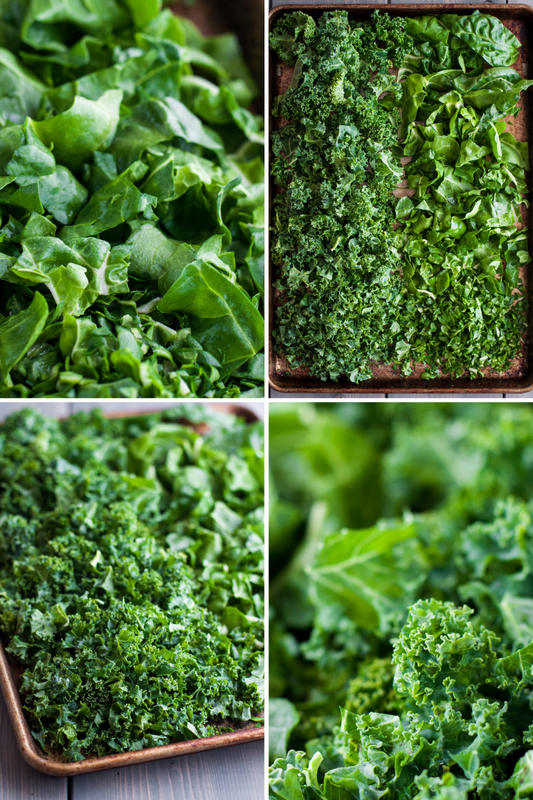 If substituting other varieties of greens, use something mild and tender in place of the chard or spinach, and something sturdy, and possibly slightly bitter, in place of the kale. Refrigerating the mixture (for 15 to 30 minutes) before forming balls helps it to firm up, making it even easier to handle. I tried it without major issues both ways. If making for a strict vegetarian, make sure the pesto and parmesan do not contain animal rennet. Varieties that work will likely be labeled "vegetarian". Note: This page contains affiliate links. It does NOT contain sponsored content. 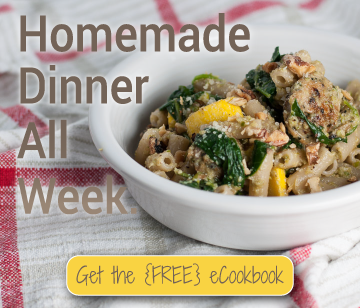 Affiliate links (to products I recommend, on Amazon) offset my ingredient and website maintenance costs, so I can keep bringing you spherical recipes like this one. Thanks! What cute little savoury nibbles! Never have I used kale like this before and you definitely have inspired me to now. These look so delicious and moorish. Thanks Thalia! Just a word of warning, they’re mildly addictive. You have stated that this is a vegetarian recipe however, parmesan cheese is not vegetarian at all. Many people seem to make this mistake, which is rather disappointing when in a food community. They do look delicious, and seeing as though I am not actually a vegetarian I will definitely give them a whirl. Hi there Jo…thanks for your concern…just wanted to let you know I’m aware of this and mention it in the recipe notes, as I often do with nutritional caveats, so strict vegetarians and total omnivores alike can enjoy my recipes in some variation. Let me know how you like them! Yum!! These looks so satisfying, and the photos are really gorgeous. I need to get some more greens in my life, ah winter. Thanks so much–this is a great way to do it, especially if the temps are sub-zero where you are!